. . . especially when one is eating alone and doesn’t commonly eat alone. This was my lunch: organic spring greens, pickled beets, local organic chevre, and organic bacon with a champagne vinaigrette (champagne vinegar, a dash of smoked paprika, a dash of agave, olive oil). Oh, and my staple glass of water, of course. Prepared in less than 10 minutes, and very satisfying. It’s great to catch up with all your informative and food-filled posts! This salad (and the previous one, especially) looks fantastic. Must try those cherries! 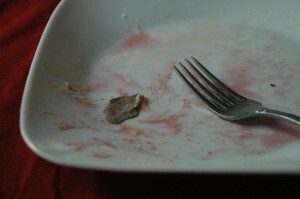 Also love the look of your scones (my mind is already working out the alternatives. . . ). Hope you’re enjoying your time solo! I found your blog on Gluten Free Girl’s blogroll, and I’m so happy to read your entries! 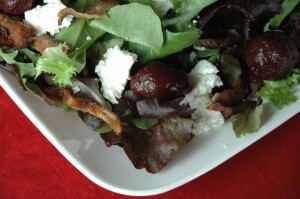 This salad looks great, and I will definitely try the one with cherries when mine are ripe. Should be June . . .
My blog has only contained gluten/allergy posts since the first of this year. But my wheat-eating friends are getting bored. So I’ve been thinking of starting a separate blog for GF entries and recipes. I can’t decide on a title. I was happy to read your first entry, that brought you to your title. I will give a litte more thought to my own path, and maybe my title will come. Thanks for making my journey more enjoyable! This recipe was on Karina’s Kitchen under South Beach recipes which i am in search of now and it looks delicious! Thanks.